A provocative thought to start 2013. Here is a statement that is incredibly important to understand if you wish to create an effective social media strategy. I think it is possibly the most important concept you will ever need to get your head around to understand the future of marketing. It is also pretty simple – one might even say it is obvious. Here it is. Traditional media is low engagement / high reach. Social media, on the other hand, is low reach / high engagement. That’s it. It doesn’t feel like a revolutionary or startling claim – but grasping its full implications is something that very few brands have done. I don’t see much evidence that P&G has grasped these implications. I don’t see any evidence that Coca Cola has grasped these implications. In fact I see plenty of evidence these organisations are either trying to give reach to their social media presence (in order to make low engagement activities and content still work) while failing to produce activities sufficiently engaging to be cost-effective in a low reach (i.e. social) environment. To understand this we need to examine, in detail, the concepts of engagement (which is largely a function of content, information or activity) and reach (which is largely a concept of scale). Most social media strategies are littered with the word ‘engagement’ and ‘content’ and then the ever-popular hybrid ‘engaging content’ which is frequently held aloft as the the all-consuming objective of social media campaigns (“Our aim is to produce the world’s most engaging content” – Jonathan Mildenhall, Creative Guru of Coca Cola in his famous Content 2020 video). But here is the thing – to even use the term ‘engaging content’ in a social media context, is to demonstrate that you have failed to grasp the implications of the, supposedly simple and obvious statement at the start of this piece. Content is a word that comes straight from the world of traditional media – the low engagement, high reach world of traditional media. You can make your content more engaging, but you can hardly ever make any form of content engaging enough to work in the high engagement low reach world of social media. Nor, conversely, will you be able to give your social media presence sufficient scale (reach) to make it work like traditional media – i.e. to be an effective channel to put single messages in front of your audience. Ask yourself this question. Where is it that your consumers have told you that what they really want from you is more ‘engaging content’? Is this the overall thrust of the ‘posts by others’ section of your brand’s Facebook page? If you seriously think this is what your consumers want, you have not been listening to them. It may well be that you have worked out that if you create more engagement you will start to push the needle on the reach of your Facebook page – but so what? Taking something that doesn’t actually reach many of your consumers and making it reach even 100% more of them doesn’t really achieve much. Twice of very little, is still very little. As an aside, I have recently been having an interesting conversation with Socialbakers – one of the leading players in providing various forms of social media metrics / measurement. (See previous post. Jan Rezab, the CEO of Socialbakers replied in an email and also a signed pdf letter (!) which he wanted me to publish. Jan – consider that thus done, although I think the best way of replying would be to leave a comment on my blog so that everyone can see the whole discussion). The basic thrust of our conversation is that Jan has been saying brands must create (and thus measure the creation of) more ‘engagement’ and become ‘friends’ with their consumers – and I have been saying that this definition of ‘engagement’ is not a concept worth pursuing or measuring, and that brands can never be friends with consumers – by any credibly social definition of friendship. Engaging content is what marketing directors want their consumers to want (largely because it is something that marketing directors, and their agencies, believe they can produce). It is high time we all paid attention to how it is that people are actually using social media (as opposed to how it is we might wish them to use social media). They are not using it to follow brands or establish ‘relationships’ with brands – some of course are doing this, but they are – and will always remain – a tiny proportion of your consumer base. What is mostly happening in social media is that people are using it to have conversations with people (real people) that they already know and are probably friends with. This space is virtually impenetrable to brands – because consumers will never by ‘friends’ with brands (despite whatever label you might want to stick on a click). Leastways, this ‘friendship’ (clickship) will be miles away in engagement terms, from the type of friendship they have will real friends. It is all a question of the scale of measurement. When you enter a social environment you have to use social scales of measurement. Something that might look very engaging when viewed against traditional content-comparison scales of measurement, probably won’t even register on the dial, when you are using a social measurement scale. Just because you are using social media, doesn’t mean that you are being social – although it does mean that you are being rated by a consumer (if not a measurement agency) against a social measurement scale – i.e. a scale where loyalty does not mean incentivised repeat purchase, loyalty means sticking by you through thick and thin. In short – no matter what type of ‘engaging content’ a brand might create in social media, no matter how much more engaging this content or activity might be than an ad, it is almost always going to be at the low engagement end of the spectrum – when that spectrum is calibrated against a genuinely social scale. If we actually pay attention to what it is consumers are doing in social media (apart from connecting with friends) we see that they are asking questions and seeking out reliable, peer-endorsed, information. This is an area where a brand can play, and it is an area where the engagement score of their activity can start to rate within a social measurement scale – as I will outline later. But I am getting ahead of myself here. Let us first look at the issue of reach, scale and media. The scale effect (i.e. business benefit) with traditional media was generated through its ability to reach large numbers of people – your entire audience – often repeatedly. This allowed the contact value per person reached to be very small because a very large amount of a small thing still adds up to a large thing. A great ad or campaign may make people a little bit more likely to buy your product – and if you can scale that effect across the whole audience that can translate into a big shift in overall sales. Social media doesn’t do scale – it doesn’t have scale built into it in the way that traditional media does. Facebook wasn’t designed as a platform to put a message in front of lots of people, it was designed to allow small groups of people to connect with each other. Therefore, the scale effect (business benefit) from social media does not lie in the ability to create a small amount of a positive effect with a large number of people – because you will hardly ever be able to reach enough people to make this a sensible activity. Instead, the scale effect comes from creating a dramatically greater positive effect per contact, albeit across a much smaller number of people (at any given time – see this post). As we have seen ‘engaging content’ is never going to rank high enough to qualify as creating a sufficiently positive experience to make its production a worthwhile activity in the high engagement but low reach game of social media. Note: you can’t solve the scale problem with social media by simply trying to add scale to your social media presence – boosting likes or followers – because it won’t be either cost efficient or possible to add sufficient scale for your social presence to start working for you the same way as traditional media does, i.e. as a channel to put a message in front of lots of people. Reaching half a million people using an ad is pretty easy, whereas reaching half a million people using Facebook is well nigh impossible. This doesn’t, of course, stop people trying – hence our collective obsession with creating ‘viral content’. Social media does, in fact become like traditional media when something goes viral and it does so a virtually zero cost – but you have to ask yourself the question: just how frequently does something become viral in comparison to the number of attempts to make things become viral. Answer: hardly ever – and even when something does, the ‘engagement’ created is often of lower value than a conventional ad, because of the need to drag the content away from a proven brand message territory, in order to give it the interest necessary to create the viral effect. Proponents of the engaging content school of thought, such as Jan from Socialbakers, may be keen to point out that more engagement leads to greater reach. The big question is – how much reach? Creating engaging Facebook posts will obviously increase the reach of your Facebook presence – but Facebook will never be an effective way of reaching your entire audience, or even a sufficient segment of it. It goes back to my earlier post about what works for you in Facebook doesn’t mean that this should shape the way that Facebook works for you (it is a bit like the non-logic in the “all elephants are grey therefore all grey animals are elephants” argument). In short, if you are going to do something that is fundamentally of low engagement (as measured on a social engagement scale) – you have to be able to do it at higher scale or reach than you are ever likely to achieve using social media. If you are using a low reach form of media (such as social media) you have to be able to increase the value stakes considerably – way above that which we conventionally associate with ‘engaging Facebook posts’. So how do you create a business benefit from engagement in social media? Basically, there are two types of engagement: the engagement brands want to have with their consumers and the engagement consumers want to have with brands – and both are totally different. Brands want to try to talk to entire audiences (reach) and put messages or promotions in front of them. This is what marketing basically does and the success of it is defined by the creativity of the message and the effectiveness of the channel strategy in distributing this message. Consumers are happy with this (in the world of traditional media) because they understand that the brand is talking to them as part of an audience, not as an individual. It is a bit like going to a Coldplay concert – this only really works if there is also an audience of which you are a part. Standing in the arena on your own would be pretty strange. However, when a consumer is engaging with a brand (in the world of social media) they are doing so as an individual and therefore the response they want back from a brand is totally different. To return to the Coldplay analogy, if you had an audience with Coldplay, as distinct from being part of a Coldplay audience, you wouldn’t want Chris Martin to prance about and sing, you would want to ask him some questions and have a chat. Understanding this difference between the world of the audience and the world of the individual, and the fact that consumers can operate seamlessly in both spaces, is the single most important step a brand needs to take if it is to understand how to deal with a consumer in the world of the individual (i.e. the world of social media). So how does a brand create value by engaging with its consumers in the world of the individual? It does it two ways. The first is by listening to and answering consumers’ questions. This is what consumers actually want a brand to be doing, rather than a brand that produces lots of ‘engaging content’ (Coldplay analogy again, you want Chris to talk to you, you don’t want him to prance around and sing). Try this for an exercise. Go to your brand’s Facebook page. Look at ‘posts by others’. See what it is your consumers are actually doing. I can guarantee that 90 per cent of what will be going on here is consumers asking questions or registering complaints that they want attended to. Then look at the total disconnect between how your brand is using Facebook to ‘reach-out’ to its consumers (lots of ‘engaging content’, probably produced by an agency) and how your consumers want to use Facebook to reach your brand. In this respect Socialbakers are spot on when they talk about a socially devoted brand, insofar as the definition of a socially devoted brand is one that listens and answers questions (as distinct from one which produces ‘engaging content’). Measuring your effectiveness in responding to Facebook questions (as Socialbakers do) is great, albeit the value you create for a business is not the speed of response to questions, it lies in the volume of questions you can answer and especially in creating an environment which encourages people to ask questions – what I call creating the expectation of listening. Social media has created an explosion of opportunity in the customer service space. This has been driven by the fact that customer service has become liberated from the channels in which it had previously been imprisoned (email and phone) – as I like to say, the social media revolution is simply the separation (or liberation) of information from its means of distribution. Customer service has gone from being a business hygiene factor to being a front-line marketing tool (albeit most marketing directors haven’t embraced this fact yet). Of course, there is also no point in then locking customer service back up again by imprisoning it in Facebook – a customer needs to be able to ask a question and receive an answer using whatever platform they want and thus brands need to be listening and responding, in real-time, across all platforms. Coming back to the issue of scale and benefit – the value you can create from an effective customer service contact and the fact that this experience can now happen in open forums and is thus seen by many, is infinitely greater than that generated via a single impression created in conventional audience-based marketing. Such a contact is high engagement and thus qualifies to operate in a low reach environment. Create 1,000 such social contacts per day and you are creating something of real value whereas the creation of 1,000 low engagement, conventional content-based contacts is largely worthless. This is in addition to the benefits that will also come from getting real-time feedback about what consumers think about your product. Note: a like, follow or share does not qualify as a valuable social contact in this game because this is still in the low order of engagement – something that may be more valuable than an ad impression, but something that is nowhere near valuable enough to create a sensible benefit unless you can extend it across a large segment of your consumer base – which of course you will not be able to do. Likes, follows and shares are also not useful indicators of a brands ability to respond to questions – they are indicators of what people think about content. And content is not the name of the game in social media – content is the name of the game in traditional, high-reach media. Listening and response is the name of the game in social media. The second way you create value in the world of the individual is by identifying the tiny proportion of your consumer or customer base who are your super-fans. These are not brand ambassadors, because they won’t want to represent your brand, nor will they be representative of your consumers. There is also no point in trying to get them to increase their rate of consumption of your product or service because they are only a tiny group and are probably already at maximum rate of consumption. However, what they will be prepared to do is become involved in your brand in areas such as new product development or customer service. Prelini Udayan-Chiechi at Lithium has a fantastic case study from Logitech where they were able to quantify the huge value that super-fans, operating in a customer service community set up by Logitech (using the Lithium platform) were able to create. But in all of this, it is essential to remember that we are always and only ever dealing with small numbers (low reach): a small number of super-fans or a small number of people – at any one time – who are asking questions. If you are going to work at the small scale, you can’t create a business benefit simply by nudging those small numbers of people a little bit up the positive engagement scale, as is a realistic objective for ads and other forms high reach, audience-based, marketing. You have to be doing something that operates at an altogether higher order of magnitude in terms of the value per contact, or else you are wasting your time. So – to sum things up. When you are in the social world, you have to use social scales of measurement and you have to create activities that will rank against this scale. The activity that is the creation of ‘engaging content’ will never rank high enough (against a social scale of measurement) to make this a worthwhile activity. You can create whatever scale you like to measure things like ‘engagement’ and ‘reach’ and get tremendously excited because you have moved the needle by 20, 50 or 100 per cent. But twice of sod-all, is still sod-all. The only things worth doing, and thus measuring, are those activities which actually rank against a social measurement scale. These activities are listening and responding to individual consumers (not trying to be their ‘friend’) and identifying those ‘super-fans’ who are prepared to actually help you make your business better. The value of a Facebook page does not lie in (and therefore should not be measured by) the ability to create engaging posts or reach lots of people. The value of a Facebook page, as with all forms of social media, lies in the ability to listen and respond to those people who wish to engage with you. It is the way your consumers use Facebook, not the way that a brand wishes to use it, that you should be measuring. And, as I have said previously, this means that Facebook itself is a form of measurement, rather than something you should be measuring. P.S Jan, if you want to respond, please leave a comment on the post rather than send me an email – in that way the conversation can become more visible – especially to those who have read the post. Richard’s point is ably made (though probably not intentionally) by wearesocial’s anaysis of the top facebook pages in the UK during December 2012 (http://wearesocial.net/blog/2013/01/top-facebook-pages-uk-dec-12/). Look at the most popular facebook posts. Levels of interaction and engagement are minimal compared to traditional media. No.3 on the list has even resorted to a £1,000 like-bribe to try to achieve some scale. Socially devoted brands don’t need to play the scale game make social media work. Large organizations that spend hundreds of thousands if not millions in social expect (need) it to be more than another channel for customer service or a place to “listen and engage” consumers — It needs to be a measurable contributor to sales. I think your article missed a key point. Social media and content created for social can scale provided that its supported by paid media. With brand FB posts now reaching only 6-15% of a brands fan base (thanks to FB’s algorithm) additional promotion is crucial. In my view, the paid model allows brands to ensure their message reaches a larger % of their fans while simultaneously acheiving the reach of traditional media by targeting similar demographics on social platforms. In short, you can have your cake and and eat it too. I think you are underestimating the value of customer service and listening to consumers. This may have been a relatively unimportant space until now, but social media is making it an absolutely critical space. I think it all comes down to the approach. 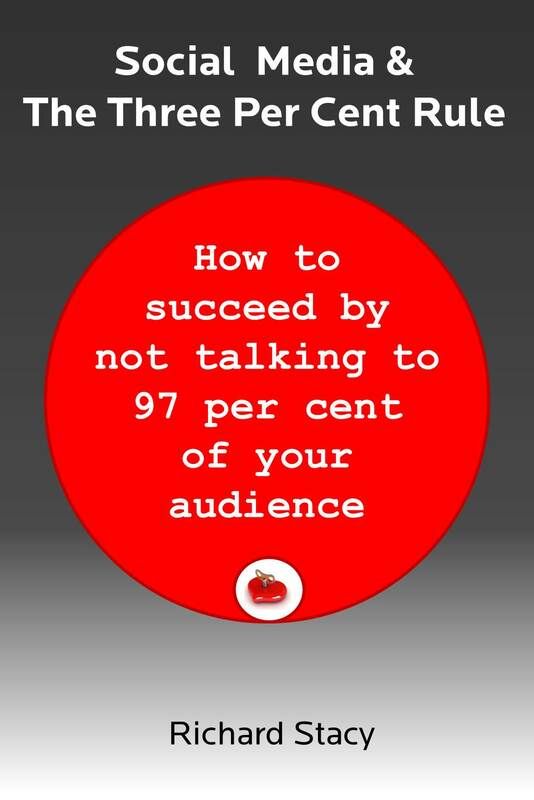 If you are putting a message in front of an audience and therefore see the game as reaching as large a percentage of that audience as possible, social media is unlikely to ever be particularly effective – because this is not what social media was designed to do. You are always going to be swimming against the tide of this particular media. Far better to swim with the tide by using a medium specifically designed to do this (i.e. mass media). You can, however, use social media to help design the messages to put in traditional campaigns. In effect use social to support campaign and message design – don’t use paid to support social. As a marketing director of a large retail organisation once said to me “I love Facebook because it allows me to see what consumers think of my latest ad.” Spot on. The first blog that I’ve read on social media that talks total sense. Really impressed and subscribed to this. Thanks for cutting the BS Richard and getting to the root of it. Look forward to more! Just because a commercial shows up on my TV doesn’t mean I watched it. Just because an ad shows up in a magazine I bought doesn’t mean I paid attention to it. In fact I can’t tell you one ad for one product in the magazines on my coffee table right now or one commercial that played on Hulu tonight. But I can tell you which brands I’ve seen and actively shared content from recently. Content that I actually shared with friends and drew attention to. You’ll never see me rip a magazine ad out and take it to poker night to show my friends. But I will whip out my phone and show a funny video (even if it is a brand created video) at poker. All of the social activities are measurable based on activity. Was I interested enough to actually click? What % of the video did I watch, etc. I’d wager that recall rates with engaging content is much higher than recall rates from flipping through a magazine. I’d also wager that if you were able to talk to every single person that an ad went out to via a “we’re in 10 million homes” traditional media and find out what % actually saw it and of that what % it actually made an impression on, and then compared that to the % of people who enagage on a piece of content that got 10 million impressions that the % would be quite similar. Because when you’re putting an ad in a magazine with “10 million subscribers” that’s all you’re paying for. 10 million impressions and you have zero idea if anyone actually gave a hoot about your ad (unless they talk about it using social media that is). I see the point you’re trying to make, but you’re also holding social to different standards. Traditional media costs millions to create and place. If you did the same with social content you could get far more impressions, targeted at EXACTLY the right people and actually know how many eyeballs saw it and how many of those actually cared to enough to click, share, etc. All of which you never truly know when it comes to traditional media. Social & engagement is just a representation of what’s actually happening in the real world. Even if it is scaled down due to a smaller budget than it’s traditional counterpart. Richard – I’ve heard you make the Coldplay analogy a couple of times now and I just don’t get it. If you were the only person at a Coldplay concert would you really want to chat to Chris Martin? Not me. What I think most fans long for is the chance to hang with the band as they do a private jam session. Share some of their unheard favourite songs and unreleased track. Hear then laugh and joke together as they mix up their stuff and do it differently. That’s what I’d love. That’s what would make me feel special and make me an undying fan. The thought of having shared in a one off experience with them. Not a chat with Chris Martin. So yes, it’s high engagement, low reach. But it’s content too. Ian, we may be stretching the analogy here a bit! I am not entirely sure they would want a private jam session – I think that is just an attempt to re-purpose audience-based content in a way which works, just with a smaller audience. I guess the point I am trying to make is that you have to be very clear about what space you are operating within – and have very different approaches dependent on this. In the audience space, people want content or performance – but in the individual space they want information or a much more personalised response. Going back to the jamming analogy – this may well be a great experience, but how to you add scale to that? This is the problem that brands have – they may be able to create experiences that are more engaging that what they have done before, but they are not engaging enough to create sufficient value to justify investment in the activity. Value comes from creating experiences that rate on a social scale of engagement, not a marketing scale of engagement, where loyalty equals put your life on the line, rather than incentivised repeat purchase. I think at this point we need another analogy! Yeah – I get the non-scaleable side. It’s your point about not wanting content I don’t get. Maybe it’s because we define content differently. As a consultant, content for me means useful, valuable information I share. A bit like you do on your blog. When you use the word content it often seems to mean advertising. So as someone in consultancy who follows Tom Peters on social media for example, I have a range of things I want from him. Most of the time I do want his content. I want to hear his ideas and insights. If I can interact with him and ask him questions and get answer then so much the better. I was delighted when on twitter we bounced quotes about non-conformity backwards and forwards. But it’s not all or nothing. I want the content too. In fact I’d feel short changed if I didn’t get his content – if I had to drag every last insight out of him by asking questions. I think we make a mistake when we assume people only want one type of thing from social media or the people they interact with it on. We’re complex, multi-faceted creatures with complex multi-faceted desires. And no, a jam session with a band is absolutely not a re-purposing of audience based content. True – the boundaries between content and information can be quite blurred – and of course they can shift based on context. There are instances where you want all the content that comes from someone, your Tom Peters example, but these are quite rare and almost never apply to brands. I put mostly content out on my blog, but the bits of it that become popular tend to do so because they are used as information – people find it because they are asking Google a question. There are some people who follow all of my stuff, but not many of them – it is the information on my blog that is the most socially useful. As a general concept, content is an audience-based idea – it comes from the world of publication. It is one single thing, designed to be seen by many people, frequently within generic time or content categories (I am bored, I want to be entertained – so give me entertaining content) as distinct from at specifc times (I need to know this right now). My bete noir in content terms is the stuff that you see on most brand’s Facebook pages and I also see laid out within brands content strategies – stuff which is just another variant of what a brand wants you to think about them, or just inane “what are you doing for the weekend” stuff which is just pumped out because of a presumed need to fill a space or appear “genuine” or “social”. You are right – we, and it, are complex, multi-faceted etc. but at some point you have to hammer this out into some sort of pattern, or else you can’t have a strategy. I have noticed you don’t monetize your blog, don’t waste your traffic, you can earn extra cash every month because you’ve got hi quality content.